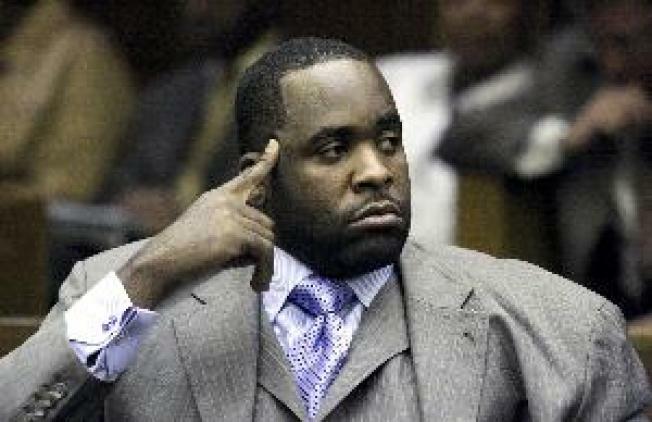 A day after being released from jail for violating the terms of his bond, Detroit mayor Kwame Kilpatrick is being accused of violating his bond again, by seeing his sister over the weekend, according to the Associated Press. Kilpatrick's sister was a witness to an alleged assault of two investigators who attempted to serve a subpoena at her home in a perjury case in July. The terms of the mayor's bail restricted him from having direct contact with any of the witnesses to the assault, including his sister. The accusation is the latest in a long string of troubles for Detroit's mayor, who is accused of perjuring himself in testimony related to an affair he allegedly had with a staffer. That investigation led to July's assault charges when investigators attempted to deliver a subpoena at his sister's home. Kilpatrick was incarcerated briefly after traveling to Canada without permission in violation of his bond. Kilpatrick's attorney told the AP that he does not believe that his client violated his bond because Magistrate Renee McDuffee stated that the mayor could have contact with his sister. His defense team accused state Attorney General of attempting ot make political hay out of Kilpatrick's troubles.